Over 41% of people in the United States are vitamin D deficient (1). So clearly, it’s not fatal in most cases, but that doesn’t mean it’s not a big deal. Vitamin D, the “sunshine vitamin”, is crucial for good mental health, bone health, immune function, and more. Before we get to the less than thrilling science of vitamin D formation and metabolism, I think it’s important to highlight why it’s so important for your health. Here are 4 of the most important and most studied benefits of having a sufficient amount of vitamin D. There are other potential benefits like a lower risk of diabetes, among others, that will be studied more extensively in the future (2)(3). Strong bones depend on many things, including vitamin D.
You probably already know that calcium is crucial for developing and maintaining dense, strong bones. What you probably didn’t know, was that vitamin D is needed to stimulate movement of molecules like calcium and phosphorus. Vitamin D is needed to absorb both calcium and phosphorus efficiently (4). A severe lack of vitamin D can cause rickets, a bone disease in children that results in frail, painful bones throughout the body. There’s also a similar adult equivalent, osteomalacia. You immune system is responsible for fighting all sorts of unwanted guests in your body and protecting you from illnesses ranging from the common cold to cancer. School children were split into 2 groups during one study. One group was given vitamin D supplements, while the other wasn’t. The group with the supplements had about a 42% lower chance of getting the flu (5). Similar studies have also shown that vitamin D helps lower the rate at which children develop respiratory infections (6). Furthermore, it’s clear that vitamin D plays a fairly major role in the overall immune system, and it will continue to be studied in this aspect (7). Vitamin D can significantly reduce your risk of developing many types of cancer, including breast, colon, ovarian, prostate, pancreatic, and more (8). While the mechanism is still not fully known, current theories are that it interrupts one of the key 7 phases of cancer development (9). Based on their results, they found that raising the minimum recommended level of vitamin D by 50% would prevent about 58,000 cases of breast cancer and 49,000 cases of colorectal cancer per year (10). But what about vitamin D and skin cancer? Don’t worry, we’ll get to that soon. There are many theories about how vitamin D helps you stay healthy. It’s often hard to isolate effects due to interactions and dependencies on other vitamins, especially for fat-soluble vitamins like vitamin D.
However, we can still look at overall trends to see if vitamin D plays a significant role in decreasing mortality, and it appears that it does. Time and time again, large meta-analysis studies have shown that a healthy vitamin D intake is associated with a longer lifespan (11)(12). It is a remarkably consistent finding. Those benefits we just looked at are just one side of the coin. The other half consists of the serious consequences of being chronically deficient in vitamin D. You’re not just risking the flu if you’re not getting enough sun, it could turn out much worse. Rickets is a disease that occurs exclusively in children. If a child doesn’t have enough vitamin D, they can’t absorb calcium effectively from food, as we talked about, which leads to bone issues. Once you’re an adult, a lack of vitamin D will still cause calcium absorption problems, but you’re obviously fully grown already. With osteomalacia, your bones get softer. The symptoms are often not apparent right away, but over time, bone pain and muscle weakness is common. This pain can occur in pretty much any bone, but is most commonly in the hip region, ribs, or legs. Due to the range in pain felt, it may be difficult to diagnose. We naturally associate the sun with cheeriness, so it kind of works out well that we believe a vitamin D deficiency can cause depression. A meta-analysis of studies in 2014 showed that for most people with depression, vitamin D supplementation had no significant effect. However, for those with clinical depression, it did have a statistically significant benefit (14). This is still far from conclusive either way. Different doses and situations should be studied in order to more fully understand the link between vitamin D and depression. Bottom line: while it’s possible that depression can be caused by vitamin D deficiency, it can also be caused by many other things. Don’t automatically assume a vitamin D deficiency when you’re feeling down. So this vitamin D stuff, kind of important, right? Well, there are 3 main sources from which you can get vitamin D.
Before we get to those, there’s one more thing you need to know. Vitamin D is a fat-soluble vitamin, which means we can store it in our bodies for months, and even years in certain situations. When we talk about daily values, think of this more as an average over the long-term. You don’t necessarily need it every day. Many people are under the impression that there’s no vitamin D in food – not quite. Food is not a great source, but you can get a significant amount from it. Excluding the fortified products (essentially supplements added to food), fish is by far the best source of vitamin D.
If you eat a lot of fish, or consume cod liver oil regularly, you probably get a decent chunk of your needed amount from that alone, which is great. 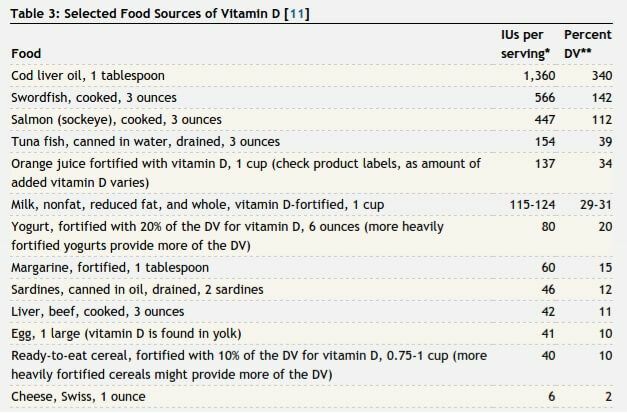 Keep in mind that when you cook food that contains vitamin D, anywhere from 10-50% of it is lost, which means those numbers in the table are more than you’ll actually get (15). The sun is by far the best (and cheapest!) source of vitamin D.
You don’t need to know all the little steps. What you do need to know is that UVB radiation from sunlight is absorbed in the skin, which then reacts with cholesterol to form vitamin D (16). 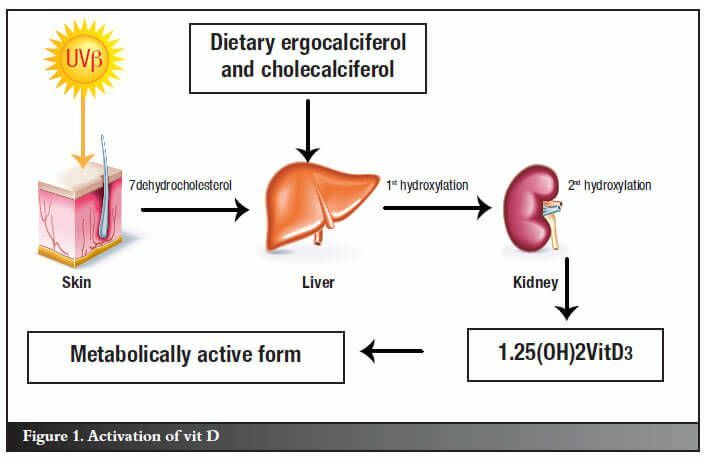 However, we can’t actually use this form of vitamin D. Instead, it goes through a few conversions until it finally is turned into calcidiol, the active form of vitamin D that cells can use. Note that skin needs to be actually exposed to sunlight in order for vitamin D production to occur. This is why it’s more common to become vitamin D deficient during winter months when you’re all covered up. Food alone usually isn’t enough. So what if you live somewhere where you can’t get enough sun, either? That’s when supplements are necessary. You can find them on the shelf at most pharmacies, drug stores, or online. There are 2 common types of vitamin D. Vitamin D2 is found in certain plants, while D3 is found in animal products/fish. Vitamin D3 is about twice as good at being converted to the active form of vitamin D (17). While most supplements are vitamin D3, double check the ingredient label before you buy them. The last main part of this guide is to determine how much vitamin D you actually need to not be deficient. However, many recent studies have called these recommendations into question. They assert that the recommended intakes should be higher for all age groups, closer to the current upper limits (18). The current maximum safe dosage is 10,000 IU per day for an adult (19)(20). I wouldn’t recommend hopping straight to that amount until more research has been done on it. However, you might benefit from getting more vitamin D if you’re hovering around or below the current recommended amounts. For reference, most studies I’ve linked to in this guide have adult patients on 4,000-5,000 IU per day (21). The actual amount you get from the sun will vary depending on a lot of factors, not all of which are in your control (like UV index). So it’s not too difficult to get a good amount of vitamin D.
Note that it said “if you’re fair skinned.” The darker your skin is, the less UVB you will absorb, and the less vitamin D you will produce (22). I’m not sure exactly how much extra time you need in the sun if you have dark skin, but be aware that you’ll need a bit more. Can You Overdose? It’s possible, but very unlikely. You would need to have an incredibly high vitamin D intake for an extended period of time (23). There is one final thing I need to address to wrap up this guide: skin cancer. I am by no means telling you to lie out in the sun all day. Get some sun, but don’t get burned. Any sunburn will accelerate aging, and even worse, it will elevate your risk of skin cancer (24)(25). There you have it, everything you need to know about vitamin D. Enjoy the sun and your good health!